A Nevada, Iowa-based agricultural equipment company saved a possible $12 million worth of business because CIRAS metallurgists helped the company confirm the viability of a new machine. 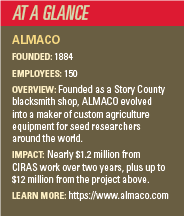 ALMACO, a 134-year-old company that makes custom equipment for seed researchers, was in the process of manufacturing a prototype combine in February when workers noticed problems with part of an axle assembly. A steel plate that had been bent during the production process was tearing along a seam. Justin Woods and the reason he sought CIRAS assistance. 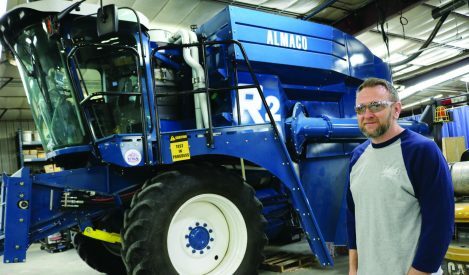 Justin Woods, ALMACO’s quality and continuous improvement manager, said the cracks weren’t a threat to the new machine’s stability. But they prompted concerns about what might happen if the wrong material was used to construct the combine’s frame. Woods contacted CIRAS project manager Adam Boesenberg for help. Had ALMACO been using the wrong type of steel? Had their supplier made a mistake? A customer was waiting for one of the machines. A potential $600,000 purchase—and possibly 20 more behind that—might disappear if production had to begin again. Days after his call for help, Woods met Boesenberg to observe the process of testing the steel’s hardness and chemistry. With Woods watching, Boesenberg explained why each test was being conducted and what was being learned about the steel. He eventually diagnosed that the metal would meet ALMACO’s needs. “What it meant was we didn’t have to call our supplier, reorder more material, and start all over again,” Woods said. He praised CIRAS for responding to customer needs. > For more information, contact Adam Boesenberg at aboesenb@iastate.edu or 515-294-5903.